It's no secret that Apple has little-to-no interest in DVDs. Just take a look at the removable media drives...now missing from all new Macs. However, there are still many Mac users who not only wish to play these discs, but also create them, especially now that the holidays are at hand. What some have found particularly irksome is that iMovie 10 () has no option for sharing movies to iDVD. Although this feature is unlikely to return, you can create something a bit like it with Automator. Here's how. To begin, you'll naturally need to have a copy of iDVD. You'll find it bundled with older copies of the iLife suite. (Updates are available on Apple's site, but require a previous copy of the app.) If you don't have a copy lying around, you can buy iLife '09 from Amazon. Launch iDVD and create a few projects based on themes you normally use. For example, Center Stage, Soft Frame, and Stretch. Don't add any movies to the projects as they'll serve as templates for future iDVD projects. Save the projects and place them in a folder in a convenient location--your Movies folder, for example. Now, launch Automator and from the template chooser select Application. Select the Files & Folders library and from this library drag these three actions into the workflow area (in this order): Ask for Finder Items, Open Finder Items, and Get Specified Finder Items. Select Automator's Movies library and drag the Add Movie to iDVD Menu action to the end of the workflow. In the first action--Ask for Finder Items--click on the Start At pop-up menu and navigate to the folder where you're keeping the DVD project files you just created. The Prompt field should read Choose a Finder Item: and the Type pop-up menu should be Files. The Open Finder Items action should read Open With Default Application. 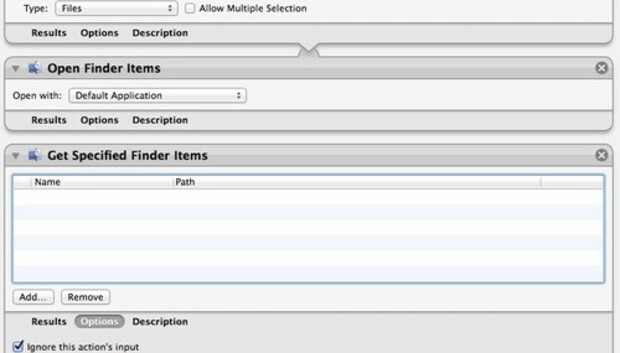 Leave the Get Specified Finder Items action empty but do click the Options button within this action. In the resulting area enable both the Ignore this action's input and Show this action when the workflow runs options. The Add Movie to iDVD Menu requires no further configuration. Save the workflow, give it a memorable name such as "Add to iDVD," and save it to a location that you'll remember. Go about your business in iMovie 10 creating those lasting movie memories. When it's time to export a movie that you'd like to add to an iDVD project, choose iMovie's File > Share > File command and save your iMovie project as a QuickTime movie. Repeat for other movies you wish to create. When you're ready to add your movies to an iDVD project, double-click on the workflow you created. When you do you'll first be prompted for a project template to use. Choose one and click Choose. iDVD will launch and display that project. You'll then be prompted to choose movies you'd like to add to the project. In the Get Specified Finder Items window that appears, click Add, navigate to the QuickTime movies you shared from iMovie 10, select those that you'd like to add to your iDVD project, and then click Continue. All the movies you selected will be added to your project. After you've burned the disc either use the Save As command to save a copy of the project that contains movies or simply close the project without saving it. That way, when you next use your Automator workflow to create an iDVD project, you won't find your template full of old movies. Is this as easy as the Add to iDVD command found in the previous version of iMovie? No. Does that command exist in iMovie 10? Again, no. What this workflow does is save you the few steps of launching iDVD, creating and naming a project, choosing a theme, and dragging in the movies you want to add to that project.